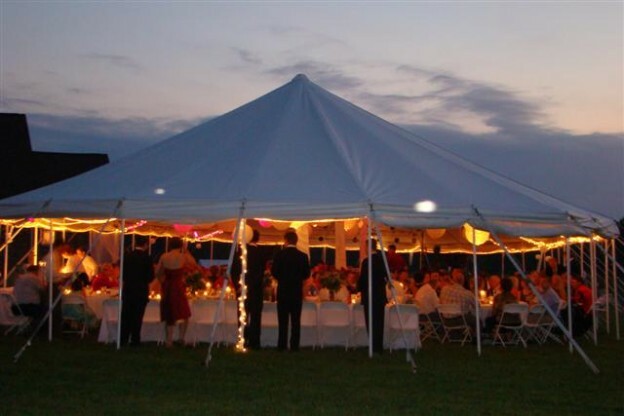 Every year tents have become more and more popular for uses like weddings, special events, revivals, church , etc.. Event tent planners, rental companies and others have continued to make their tents more glamorized by using pleated ceilings, swag, specialized lighting, furniture and decor. Planning an event involves a lot of time, dedication and detailed work by the event planner. With good communication between the event team and their customer and vendors, there can be a wonderfully successful event. The ceiling: Whether the event tent is for a wedding, corporate event or general celebration, the decor inside is critical. There are many different choices for the ceiling that can really take the breath away from the guests as they enter the tent and look up. A pleated ceiling is very popular. They are a classic and elegant choice. Typically available in many colors there are choices for very professional and upscale events to casual ones. They come in a prefabricated pleat which is a tent liner already pre-sewn and a pleated fabric ceiling liner that is manually installed with rolls of fabric in a pleated fashion. The second choice takes much more time to install but allows you to make a more custom appearance. The Lighting: If you have chosen your pole tent or frame tent and know how you want the ceiling, you are probably thinking about how to properly light your tent. There is nothing as beautiful as having the combination of a ceiling and lighting. There are many choices: String lights look great against any tent ceiling. They are easily draped at different angles or right up near the tent top. They provide great reflection and help natural light. Twinkle lights are like string lights but they have smaller bulbs and are closer together. They are often used to wrap around the poles as well as between the layers of ceiling decor. Either choices will automatically enhance your event tent. Up-lighting is another popular choice. They are placed on the floor to wash/splash lighting on different areas of your tent top. You want the amount and color of the lights to work well with your interior design. Lighting is very important for your event. It’s not just about what type of lighting you use but how it will work with your decor, furniture, etc.. That will set the mood of the party or event so plan carefully and make good choices. Furniture: Most events require tables, chairs, couches, dance floor, staging, linens, etc.. What you choose depends on what type of event you are having. For a casual event the most simple tables and folding chairs can suffice but If it is for a corporate event or wedding there are many beautiful choices. You can use nicer padded chairs and even add some arm chairs, couches and taller tables for guest to enjoy their food & drink. Be sure and create a floor plan that best uses the space available within the tent. Linens simply need to match the event you are having. You might use simple cotton or use high end table clothes and napkins for a corporate tent event or party. Decor: Decor will be unique because it reflects on the individual or group of people designing the layout under a tent. The lighting, center pieces, wall designs, pipe & drape, flooring, etc. will not only reflect the designer but should also go with theme of the event. With basic tent event planning knowledge and working closely with your customer and vendors, you will have a wonderfully successful event. All of your hard work will pay off with many referrals and the continuing knowledge of what works best. This will allow you to make your clients happy and wanting to have another tent event again.